16 Days of Activism against Gender-Based Violence Campaign starts from 25 November: International Day for the Elimination of Violence against Women till 10 December: Human Rights Day every year. Civil society organizations, activists, Governments, the UN and many more have been participating actively in organizing advocacy and campaign activities both globally and locally. In Fiji, the elimination of violence against women has been the priority issue of the country to address, and the Ministry of Women, Children and Poverty Alleviation takes the lead of carrying out the campaign and talk to the people. A team of government officers visited communities on Kioa Island and Rabi Island during the Campaign last year. It was part of the project activities which provide awareness raising and government services including social welfare schemes, legal aid and various civil registrations. The key message, ‘Talk openly about violence against women with both men and women in the communities’ was delivered to people. Kioa Island and Rabi Island are located close to Vanua Levu, the second largest island of Fiji in the Northern Division. Both are accessible by small boat. Both Islands are visited by tourists of cruise ships. People living on Kioa Island and Rabi Island originally came from other Pacific Islands. Some people from Tuvalu moved to and settled down on Kioa Island when their original island in Tuvalu became overcrowded in the 1940s. In recent years, the idea of migrating whole Tuvaluan to Kioa Island and other Pacific Islands has been taken seriously as the sea level continues to rise due to the impact of climate change which affects low-lying coral atolls in the South Pacific Ocean. People living on Rabi Island originally came from Banaba Island which is part of Kiribati. Under the British rule, phosphonate mining was developed on Banaba Island. After the short period of Japanese occupation during the Second World War, the phosphonate mining was revived by the British colonial government. Because of the further exploitation of the mineral, Banaban people were replaced and sent to Rabi Island. Both Kioa Island and Rabi Island have been integrated in Fiji’s administrative system and granted some degree of autonomy. While being citizens of Fiji, people on both Islands have been maintaining strong ties with their respective original land and keep their language and tradition alive. A simple small engine boat took us across the sea, and in half an hour we landed on the sandy beach of Kioa Island. The overview of the community from the shore looked just like another Fijian village. The community leader, who is the leader of the Kioa Island Council, the administrative body of the community, welcomed us. We sat on the mat woven from Pandanus leaves, as usual in a village setting, and started presentation on the government services. Heavy rain however disrupted our voices and people’s attendance. The session was reconvened after dinner. People on Rotuma Island, an island of Fiji in the Northern part, and closer to Tuvalu, has long-time, inter-island relationships with people in Tuvalu. We met some couples of Rotuman wives and Tuvaluan husbands. We were treated with healthy plates of local food, nicely decorated with crabs, steamed breadfruits and slices of pineapple. Officers talked to the people what the Ministry does to prevent and address violence against women and children. The 16 Days Campaign and the SDG 5 were explained to them too. No particular violence case was reported in the community during the session. The message, ‘talk about it openly with women and men together in the community’ was emphasized by the officers. Next morning, some women introduced us the activities done by their women’s club. They have a plan to relocate and rebuild a canteen to serve tourists. Their handicrafts such as Pandanus baskets are well made and often showcased at the National Women’s Expo which aims to promote women’s handicrafts and connect to the market. We left the shore of Kioa Island in the morning when the sea is fresh and calm. Rabi Island is bigger than Kioa Island and has four villages. The building of the Rabi Council of Leaders is the center of the Island. A road connects the villages to the center, where people are getting off a small truck just arrived. It looks like a small town rather than a village. A council officer invited us to the historic building of the Council. It functions as local government office. We set up our awareness raising presentation outside so it can be seen and heard by people passing by or sitting under the tree across the road. A 67 year-old man, who stays on the Island by himself, came from his village by truck to apply for social pension. 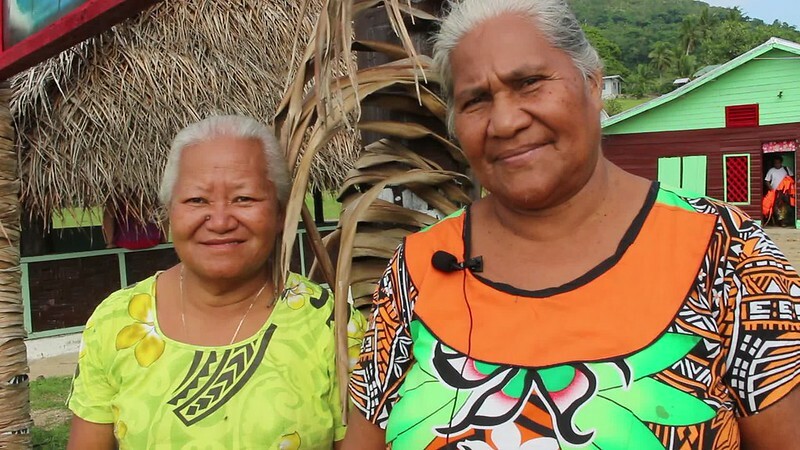 It is not unusual in Fiji that younger generations left the village to search for employment opportunities in town while senior members remain in their villages, having difficulty in continuing their subsistence farming as much as they used to. Elizabeth Hedstrom is Chairperson of Buakonikai village. She is one of a few woman village leaders in Fiji. Rupe Uatu is a village council member working with Elizabeth. They requested the Ministry officer to make a presentation loudly on violence against women. A women’s club on Rabi Island produces quality coconut oil and coconut soaps. The factory is supported by the Ministry to promote women’s entrepreneurship. The oil scented with flowers is good for massage and non-scented one for cooking as well. 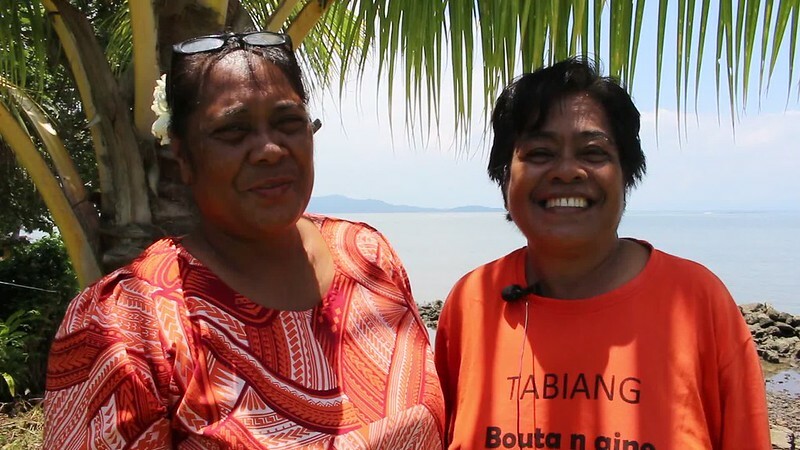 Do you know how to say Gender Equality in Tuvaluan and Banaban? Repeat after Grete and Evotia in Tuvaluan, and Elizabeth and Rupe in Banaban.